Rates have finally decided to break on through (to the other side) to quote The Doors. We have been talking about how rates have been knocking on the door for awhile now and it finally happened. This week the 10-year bond yield crossed 3.03% and the 30-year bond crossed 3.22% today. Real estate agents need to be aware of this change and if they are not, the market will gladly teach them a finance lesson. Here is a look at the treasury bond rates as of today on CNBC . 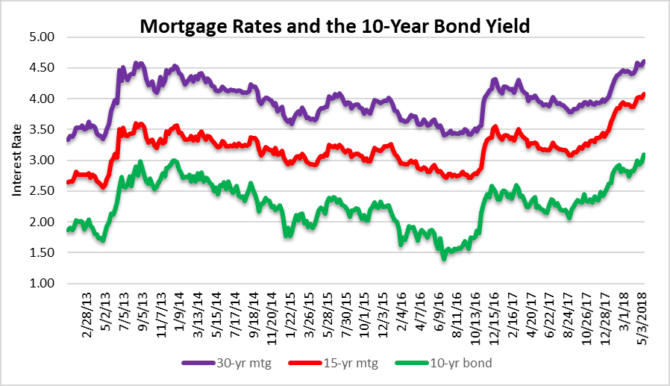 As for mortgage rates, this first chart today shows that we haven’t even been charting long enough to see the 10-year bond and mortgage rates at these levels. We saw a 30-year mortgage rate of 4.58% on 8/22/13 and today we reached 4.61%. The fact that we cruised past crucial resistance just reinforces that rates are going higher. To put it simply, real estate prices were being propped-up by fake rates. Maybe you haven’t believed us, but you will start seeing sellers and their agents wondering why their properties aren’t selling. Here is a quick look at Fort Lauderdale area residential real estate prices through the month of March. Over the next few months you will see the prices slide. Just wait! 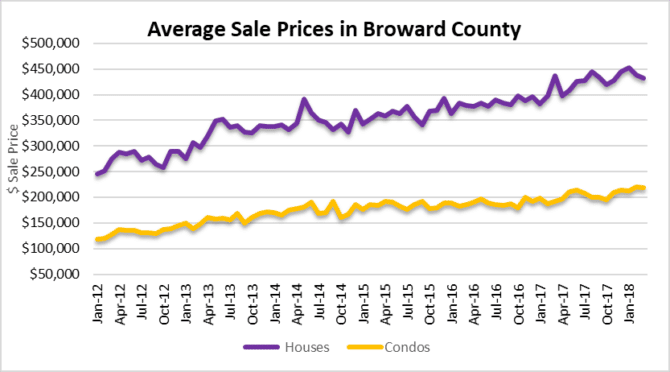 Take a look at this next chart of transaction volume in Broward County, Florida. This area includes Fort Lauderdale, Pompano Beach, Hollywood, Weston, Plantation, Coral Springs and other cities. 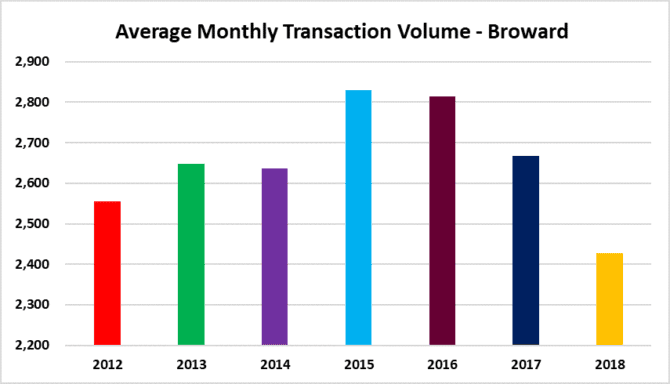 Transaction volume has already been declining, even with rates at historically low levels. What will happen as rates begin to normalize? As deal volume drops, prices are usually next to decline. Things are about to get very interesting in the residential real estate market. Foreclosure filings have been on the rise again in Fort Lauderdale. This metric has been ignored as most people have been touting the “housing recovery”. 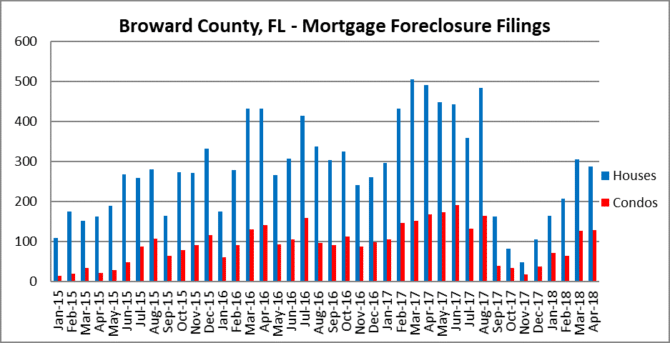 It’s probably not a good idea to ignore the recent climb in foreclosure filings, as this is yet another factor that will impact the South Florida market. Low rates allow people to make purchases they really shoudn’t make and housing is no exception. There are still thousands of mortgage default cases lingering from the last crisis and new cases are being piled on top of them. After a brief hold on new filings after Hurricane Irma, the banks are filing their cases at a good pace again. We couldn’t make this post without including this classic from The Doors . This entry was posted in Foreclosure activity, Fort Lauderdale foreclosures, Fort Lauderdale real estate, Market Insight, Mortgage rates, South Florida Real Estate and tagged Florida real estate, housing bubble, mortgage rates. Bookmark the permalink. Both comments and trackbacks are currently closed.